So now that November is rolling out at last, as we are well into December, dare I ask when we might expect a December security patch. "Well into", as in 2 business days since the Dec bulletin? JOHNGAETANO and Vistaus like this. Well let's see: three business days in to a month to pay a mortgage, rent or employees or for that matter for most other commitments would not go over too well. With regard to updates, sadly, they have trained us to be deliriously thankful if a release comes out in the first half of the month. Forget the security component, when dealing with a system that still has bugs that haven't been addressed, that is frustrating. Let them stop making promises and admit that the releases will be periodic like the competition. Last edited by yybenedb; 12-09-18 at 12:42 PM. CrackPriv and Crusader03 like this. Last edited by Bob80220; 12-09-18 at 01:19 PM. Well let's see: three business days in to pay a mortgage, rent or employees or for that matter for most other commitments would not go over too well. Depends on your definition of "timely". According to Android Enterprise (for which BBMo is officially approved), "timely" is 90 days. Don't forget that patches are only one piece of the security puzzle. Jake2826, Vistaus and Rico4you like this. ABM374 was PTCRB certified recently but who knows when it will be released or any details about it. 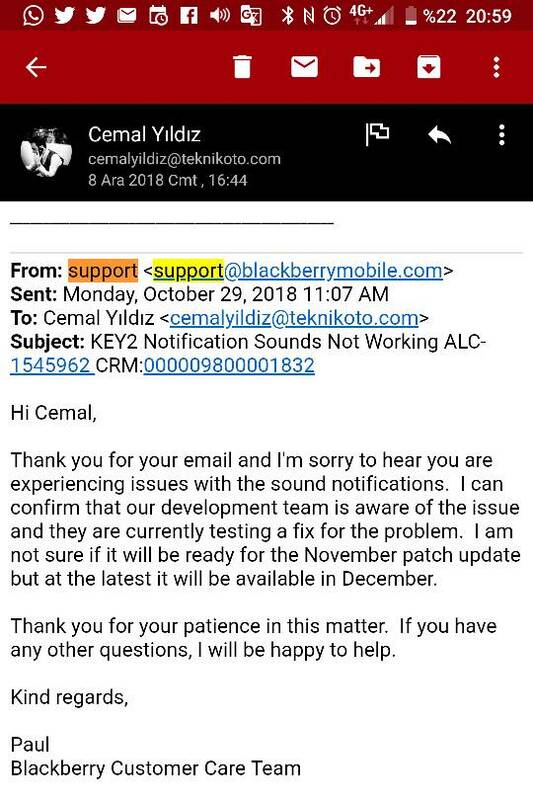 I received November patch few days for my key2 so I highly doubt that we'll receive December patch soon. FYI, Dec patch, ABM374, has just been certified for the BBF100-2 and BBE100-2. Last edited by conite; 12-09-18 at 04:18 PM. rkanazawa and Rico4you like this. First I need the November patch for that, but it hasn't even shown up on the BlackBerry servers so far... so I highly doubt everyone is getting the December patch in December. Not that I care all that much, unless the December patch contains big improvements. But if not, I'd rather have them focus on Pie (I want my webOS-style multitasking!!! even if it doesn't contain the multitasking up gesture, I don't care, I'm using Fluid Navigation Gestures anyway, as long as I get the cards multitasking, then I'm happy). ABL911 has been spotted for several BBF100-1 and BBE models. Last edited by conite; 12-10-18 at 07:36 AM. Last edited by Yvgeni; 12-10-18 at 12:35 AM. I think it's the patch that will end the notification sound problem. BBMo said it would be ready in the interval. my PRD will get this version soon. BlackBerry doesn't peddle their metal and push hardware anymore, so don't aim your arrows at BlackBerry. Hey guys, just drank the coolaid! I can now join the ranks of the apologists, flat earthers and deniers! Our beloved BlackBerry's are perfect! Please promise me anything, release half baked and please take my money! I am now more than willing to pay hi-end flagship prices for whatever you release and walk away with a smile no less! By the way, does the coolaid effect wear off? How often do you guys use? Just want to be sure this dizzying euphoria does not wear off and dive straight back into reality!!! Lmao!! !